Lovely design, fashion style. Adorned with zinc alloy, bride and groom shape. Do you still looking forward a gift for your her/he? 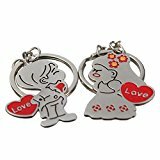 Here you have found the right place, this pair of keychain not only the best gift for yourself but also the best for your friend and her/he, elegant gift for bride and groom. Keychain means put two heart together, have a good moral. Wish you will like. 1. Due to the difference between different monitors, the pictures may not reflect the actual color of the item. 2. The style of this pair of keyrings will be sent by random, with word” love”, or without the word ” love”. Use this to storage your keys and take with it everywhere. When you are missing him or her, just need to look this for one eye then the happy will around you all the day.